Developmental Learning Sciences: January 15 for Early Consideration. May 1 for Fall. October 1 for Spring. Counseling Psychology: December 5 for Fall. Quantitative, Qualitative and Psychometric Methods: January 15 for Fall. October 1 for Spring (M.A. only). School Psychology: December 1 for Fall. The Department of Educational Psychology offers a Master of Arts (M.A.) in educational psychology, an Educational Specialist (Ed.S.) in educational psychology, and a Doctor of Philosophy (Ph.D.) in psychological studies in education. The M.A. and Ph.D. require applicants to choose a specialization from developmental and learning sciences; counseling psychology; quantitative, qualitative, and psychometric methods (QQPM); or school psychology (Ph.D. specialization option only). The Developmental and Learning Sciences is focused on advancing and applying theoretical understanding of 1) Social and Emotional Development, 2) Cognition, Learning, and Instruction, and 3) Educational Neuroscience across the lifespan. The Quantitative, Qualitative and Psychometric Methods is a multidisciplinary program that provides students with a wide range of skills related to research methodology, educational and psychological measurement, and applied statistics. The program is unique in its emphasis on qualitative, quantitative and mixed-method research approaches, and in the integration of cognitive and developmental principles of educational psychology. The Counseling Psychology program strives for an equal balance between science and professional psychological practice in the general context of a life span model of human development oriented toward community agencies, schools and college settings. The counseling psychology program is accredited by the American Psychological Association. The School Psychology program is highly respected both locally and throughout the nation. Students are directly admitted to the Ed.S. or Ph.D degree, but will earn a master's degree in route. The Ed.S. program is designed primarily for individuals who wish to work in public school settings, and is approved by the National Association of School Psychologists. The Ph.D. program prepares graduates for practice in universities, schools, hospitals, developmental centers, mental health centers, clinics, and private practice. 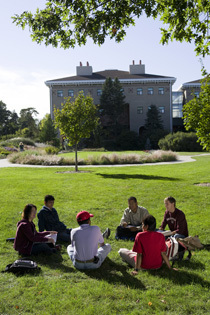 The Ph.D. program is accredited by the American Psychological Association, approved by the National Association of School Psychologists, and leads to Nebraska licensure in professional psychology. For additional details check out the dept./program website: Educational Psychology.